The Golf Advisor rankings describe the links course as ‘one of the toughest’ in the Northwest. The White Horse Golf Club, located on the northwest of Seattle on the Kitsap Peninsula five miles south of the Kingston ferry terminal, has earned the top rating in Golf Advisor’s Best of 2018 golf courses in Washington. Golf Advisor, an online destination for golfing enthusiasts, publishes reviews and rankings of courses open to the public at least part of the year. The rankings are based on an assessment of six categories: value, course conditions, layout, pace of play, friendliness and off-course amenities. White Horse Golf Club, which opened in 2007, was acquired by the Suquamish Tribe three years later. The tribe retained local architect John Harbottle to upgrade the golf course. 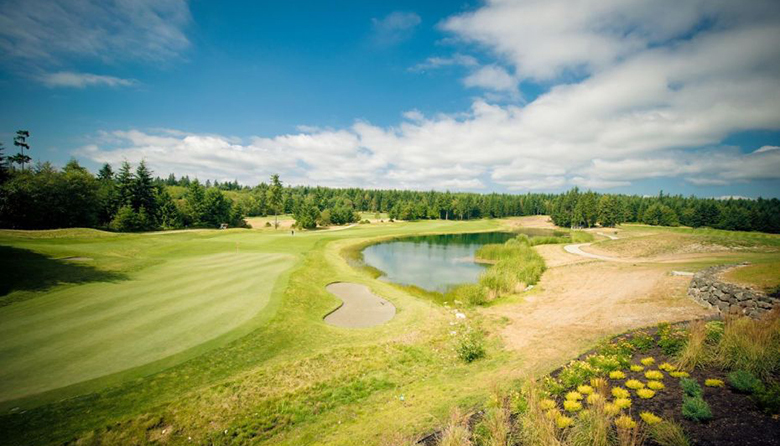 “When the Suquamish Tribe bought the club in 2010, one of their top priorities was to make the course more playable,” Golf Advisor’s review of the course states. “They enlisted John Harbottle for the job, a local architect who has designed several layouts throughout the state. The review adds that the White Horse links course offers golfers a picturesque setting ― located between the Olympic and Cascade mountain ranges with “panoramic views on every hole.” Green fees range between $45 to $62. White Horse not only ranked No. 1 in the state of Washington, according to Golf Advisor, but also earned a 35th place showing nationally, among some 2,800 golf courses reviewed. It was the only golf course in Washington to make the national list. Other top-ranked golf courses in Washington state include The Cascade at Gold Mountain Golf Course in Bremerton, No. 5; Wine Valley Golf Course in Walla Walla, No. 4; Skamania Lodge Golf Course in Stevenson, No. 3; and The Olympic at Gold Mountain Golf Course in Bremerton, No. 2.